A classic, fully restored 9ct Rolex Precision dress watch from 1961. This watch has a superbly restored Ivory Cream dial, complete with original, restored ‘Dauphine’ hands. 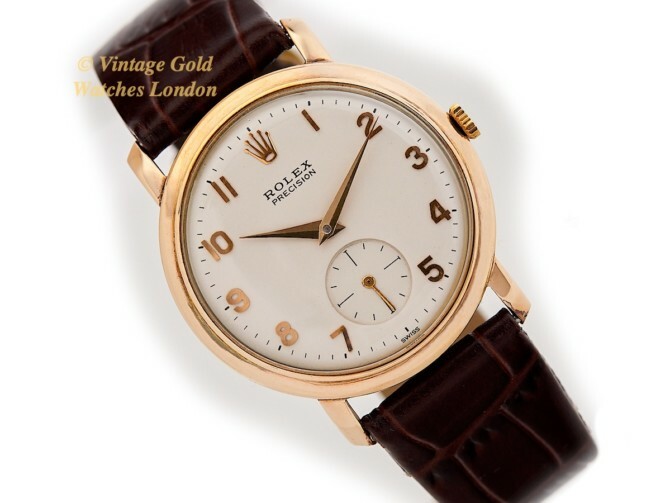 The dial is also quite special for having solid gold 1 – 12 numerals and is the much rarer design of dial with the subsidiary seconds dial at 6 o’clock. This design was giving way to the centre seconds dial by the early 1960s, but Rolex still produced a small number of watches with this design for customers with a preference for a subsidiary seconds dial. A classic Rolex dial of the 1960s, but with the rarer early subsidiary seconds dial at 6 o’clock. The dial has the famous Rolex ‘Coronet’ applied to the dial at 12 o’clock and is signed ‘ROLEX’ and ‘PRECISION’ with ‘Swiss Made’, below the ‘6’. This solid gold applied numerals dial is wonderfully elegant, very clear and easy to read and the original restored ‘Dauphine’ design hands complete the dial. This is the original dial which has been restored to the very highest standards by our dial restorers, who are considered to be the best in the UK. During the restoration, the lens was replaced with the correct specified new original replacement part. The original, very high quality solid 9ct yellow gold case is in immaculate condition, having been very lightly used and very well cared for. Our case restorer has cleaned and then carefully examined the watch case, inside and out, under high magnification for signs of fatigue or damage and has declared it to be in perfect condition. Having then applied some very careful and gentle hand-polishing, the case is now immaculate and shows no scratches, dings or signs of wear visible to the naked eye. The case was made in England by D. Shackman & Son for Rolex and is a good sized case measuring 33mm in diameter, excluding the Rolex signed crown, and 39mm top to bottom, including the lugs. The inside of the case-back is signed D.S.&S. with the case reference number 17372. Correct Birmingham UK 9ct gold hallmarks date this watch to 1961. Shackman watch cases are particularly highly regarded for their high quality design, construction and finishing. The press-fit case-back clicks into place with a very satisfying ‘pop’ and it is of full thickness and has never been inscribed. This watch was not specified as water resistant when new and so as ever, our standard advice applies: Vintage watches should be kept clean and dry at all times. As can be seen, the high grade Cal.1000, 18 Jewel, hand-wound ‘Verislim’ movement is in incredibly clean and sparkling condition. It has just completed an overhaul and service by our vintage Rolex specialist watchmaker and winds, sets and runs perfectly. These Rolex Cal.1000 movements were also used as Chronometer rated movements in the earlier Rolex Verislim watches as seen here. They are highly regarded for their accuracy and reliability, making this watch perfectly suitable for everyday use. Following its service, the movement was calibrated and final tested and was found to be running arrow straight at +3 seconds per day! This is truly excellent and has been checked on our electronic watch Timegrapher. This movement also has a superb 58-hour power reserve when fully wound. The movement is signed Rolex SA, Geneva Swiss and Eighteen Jewels and is marked with the Calibre number 1000, along with the reference number N647264. This particular movement is in superb condition and with regular servicing, say every 3 or 4 years, we would fully expect this watch to run quite happily and provide very faithful service for another 60+ years or so to come! We have no hesitation in offering this watch with our 12 months’ written warranty*. A high quality, Brown genuine Crocodile strap has been fitted, along with a matching gold plated Rolex buckle. We feel this strap suits this watch very well, however, a Black Lizard or a Tan Ostrich strap are also popular alternatives. If a different colour or style of strap is preferred, please let us know and we will do our best to oblige free of charge. We carry tan, conker, dark brown and black in stock, in plain padded leather, crocodile skin or lizard skin. We can also obtain most types and colours from our partners at ‘Watch Obsession’ within 48hrs. Please take a look at their huge range of 16mm straps if you wish. Although there are no original documents with this watch, the movement the numbers and case markings are all correct and date this watch to 1961. A detailed written receipt with 12 months’ warranty* and a separate insurance valuation for the replacement value will be provided at the time of sale along with our unique ‘Lifetime Authenticity Guarantee’ which states: “If this watch proves to be anything less than totally authentic, or not as described, Vintage Gold Watches of London will offer you a full refund at any time”. The Rolex presentation box as shown in the accompanying photographs is included in the sale. This is a beautiful, rare, collectable and totally practical vintage wristwatch from horology’s most famous name, which will not only make an excellent dress watch but also a practical, highly accurate and reliable timepiece to use on a daily basis should you wish to do so. It will also provide an excellent investment as well as be something to use, wear, treasure and enjoy! A word on our prices – We always try our hardest to acquire the very highest quality watches we can find, before then restoring these to the highest possible standards. We then offer these at the fairest prices we can, taking into account our pre and post sales care and service. This approach means we will never be the cheapest, but nor will we be the most expensive. Indeed there are some well known stores in West London which are highly successful charging between two to three times the price you see here. We therefore consider our prices to be fair, given the quality of watches we have to offer. If you have any questions, please call our landline 020 7727 7095 or mobile 07515 949 250 or if calling from overseas our landline number is +44 207 727 7095 or mobile +44 7515 949 250.